Some of you may have known me when I was an Eco-Advisor for a company called Only Green several years ago. I was so disappointed when it closed its doors because it meant that I would have to start researching new products to use for our family. I’m very excited to announce that someone who was in charge of manufacturing many of Only Green’s products has just launched a new company: First Element! 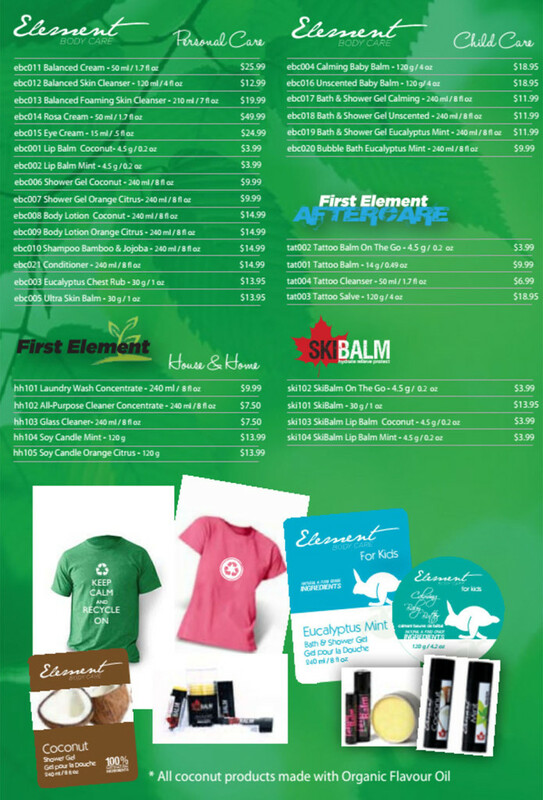 So kickstart some of those green new year’s resolutions by trying out First Element. Check the First Element website for products and contact me to place an order at a discount! I used the OnlyGreen version of this with my daughter since she was an infant. I’m happy to report that this one delivers just as well as its predecessor – super gentle and cleansing, and foams nicely in the bath. This lip balm is amazing! I love how easily it glides on – you know how some lip balms are hard to get on, and you need to put in some effort to make it go on your lips? This lip balm makes application effortless, even on a squirmy toddler (by the way, she loves this lip balm too!). What First Element product do you want to try?